This series is about sharing my friend’s thoughts, a bit of their lives, and the impressions they’ve made along the way. In conjunction with telling you a little something about the role my dogs have played in my life and how they influenced my decision in becoming an author. As I mentioned in part one of this series, each of my Dobermans represents different times in my life. Today, I’m focusing on my first male, Dax. In late 1994, my husband, Ralph, and I decided we wanted a red male. I’d been training and showing in obedience and Ralph wanted a dog he could train. 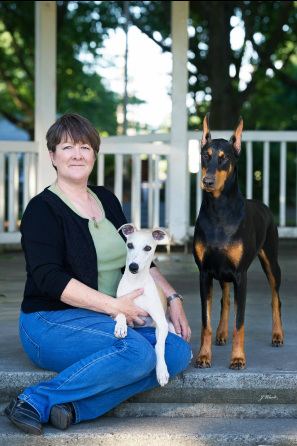 We searched the state for a breeder and found, Elaine Hopper of Starlaine Kennels. Dax came into our lives in 1995 and opened the door to the world of conformation, otherwise known as the breed ring. He was a truly amazing dog and gave his entire heart and soul to us. Over the last fifty years, I have owned and trained many dogs, including labs, malamutes, spaniels, setters, and boxers. However, until I found Dax, I had never had a dog touch my soul in the way he did. We spent nearly every day together. When I was at my desk he would push his way around my chair to lay under my desk until I was finished. He would do anything for a Frisbee and a stick. For one of our games, I would put him on a sit-stay on one side of the house, walk around to the other side and hide a stick with my scent on it, then call him to “find it.” It was amazing to watch him find the “scent cone” and zero in on the stick. On the few occasions that I would leave the house without him, when I returned I would call out for “my big boy” as I opened the door. I had better be ready, ‘cause he was’a comin’. Not only did Dax come into our lives at that time, but so did Elaine. Elaine is a dear friend and is always willing to help and support us. 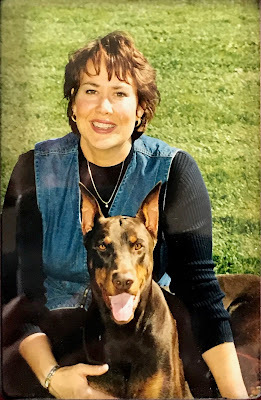 She taught me many things about the showing, like how to groom a Doberman for the show ring – yes, they do need to be groomed. I’ve traveled with her to many shows and have tons of cherished memories. Today’s guest is Elaine Hopper. Me: Elaine, please tell us about your history in dogs? Elaine: Since I was small I have always had a dog in my life, but I fell in love with the Doberman breed in particular. A friend of my mother's had a Doberman when I was about 12 and I really loved that dog. Since that time, I always wanted one of my own. I got my first Doberman in my 20’s when I shared a house with a friend. I didn’t have a lot of money then, so I got her from the paper. 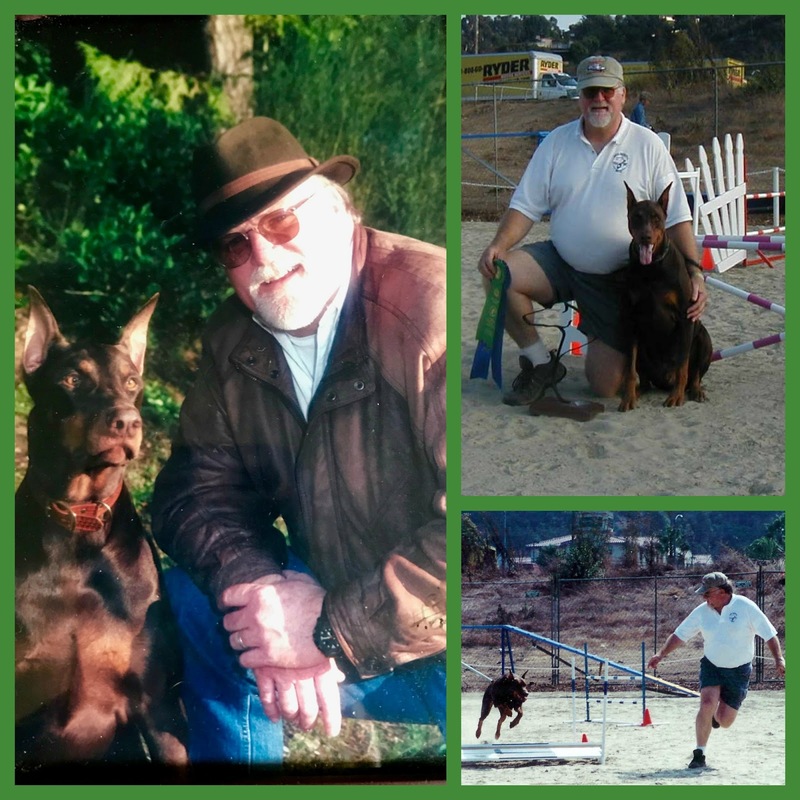 From there, I started taking obedience classes and decided to join the local Doberman club where I learned a lot more about the breed, dogs in general and met many of the local show folks. 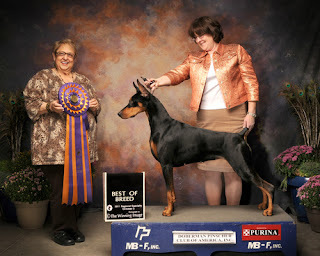 I got a second Doberman from a local breeder and showed him to his championship and several obedience titles. I became hooked on not only the breed but also conformation training and showing as well as the thought of having a litter one day. My first litter became a reality in 1995. I started showing my own dogs as well as those belonging to others. Over the years I have had many successes and have traveled all over the country competing. I have continued to serve the local Doberman club in many ways, including holding numerous board positions. I also serve on the board of the national breed club, the Doberman Pinscher Club of America. To date, I have handled many dogs of all breeds to championship titles and I have bred 30 Doberman champions under my kennel prefix of Starlaine. In addition to Dobermans, I have also become involved with whippets. I have owned several and bred three litters that produced multi-titled puppies. Me: You’re involved in numerous clubs and activities. You donate a large amount of your time to shepherding/supporting our breed. Please tell us about this. Elaine: I have held every officer and board position in the local club, the Puget Sound Doberman Pinscher Club, and I have been a member for 30 plus years. I have held numerous committee positions as well, and currently I am in charge of heart testing equipment owned by the club that members can use to health screen their dogs. I have also involved our club in community service activities. Most recently, we donated pet resuscitation and training equipment to two local fire departments. This, in particular, I find extremely rewarding, giving back to the community and highlighting the activities of our club and representing the breed as a whole. I started the same health screening holter program at the national level and I currently serve as the Second Vice President of the Doberman Pinscher Club of America, which not only aims to protect the breed but is also involved in public education and donations to health research. Me: You have been involved in holtering for as long as I can remember. Could you please explain why this is an important health practice and what it could contribute to our Dobermans in the future? Elaine: The holter is a heart monitor that is attached to the dog for a 24-hour period. 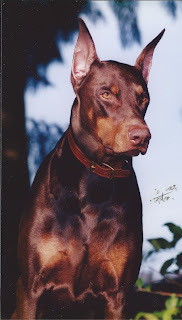 The holter records heartbeat activity; in particular any irregularities, something that is a problem in the Doberman breed. I first started doing this test back in the early 90s through a university program. Since then, the use of holters has increased significantly as more owners and breeders have realized the benefit of screening their animals so issues can be detected and treated early, or breeding animals with indications of disease can be removed from the breeding pool before they can pass on problems to their offspring. I believe very strongly that as breeders, owners, and custodians of the breed we need to do everything we can to eliminate disease or at the very least make sure our breeding animals are completely healthy to give the next generation the best possible life. Me: What are your goals with regards to breeding? Elaine: My goal always has been to produce not only beautiful animals, but animals that are healthy and live as long of a life as possible. I also want to make sure I carefully select for temperament so that dogs I breed are good ambassadors for the Doberman breed as well as loving, stable companions. Me: What part do your dogs play in your life? Elaine: They pretty much are my life. I spend countless hours working with them and doing training. I also attend many shows a year showing my own dogs, dogs I bred, or those of clients that have contracted for my handling services. I have met so many wonderful people throughout the years that are as involved as I am with Dobermans, or dogs in general, and I am happy to say I have dear friends all over the US as well as outside the states because of my involvement with dogs. I would not trade these experiences or friendships for anything. Me: Do you ever picture yourself without a dog? Elaine: No, I really don’t. They play such an integral part of my life and are such wonderful companions. I really do not ever foresee being without one. Me: Without using the word, love, please describe what your dogs mean to you, in no more than 2 sentences. In other words, what you are describing is your definition of Love. Elaine: My dogs represent companionship, security and unconditional devotion. As I mentioned in part one, my dogs played a major role in the turning point between which of the two career paths I would choose to follow. When we were showing Dax, we spent at least two weekends a month at a dog show. We purchased a travel-trailer, packed it up, loaded the dogs into the van, and traveled the west coast. We made lots of new friends and had a great time submerged in the world of dog shows. So much so, that I was thinking about working towards becoming a judge. I’d been working as the administrator with Ralph in our forensic engineering, accident reconstruction company. We decided to shut down that business when he was offered a position back into the marine engineering. I was at a turning point. I always wanted to write. I’d written in journals for years. But part of me still wanted to become a conformation judge. Dogs were my life and I wanted them included in whatever I chose to do. Then, I realized this was my opportunity to do what I'd always wanted to do – write. And, if I didn’t start immediately, I would never have the chance again. I started jotting down ideas for my first book that same day. A few days later, I was sitting in the living room, Captain, my second red male, was by my side. I had the bits and pieces of the book I wanted to write, but something was missing, and I couldn’t for the life of me figure out what. I was petting Captain and talking to him about my problem, having long conversations with my dogs was an everyday occurrence. Captain laid his head on my leg and it came to me – I needed to include my dogs in this book. It was at that moment the words finally started to flow, and The Winters Sisters began to take shape. I had my idea and it came in the form of the love of my dogs. But even with this idea, I didn’t feel like my heroine was complete. She needed something to make her special…In part three of this series, I will share with you how my heroine, Victory came to life. As I mentioned before the Dobermans on my book covers are my own dogs. It felt right to put Dax on my first book. Dax loved his Frisbee, but he lived for his dad. The last picture of Dax I will always hold in my mind is of him and Ralph playing tug across the lawn on the waterfront. It was mid-morning. From the distance I was standing, they were both just silhouettes. Dax trotted across the grass and he looked like the young dog I remembered just two short years ago. He was a special dog and the pain we feel from his loss is almost unbearable. There will never be another DAX. My only regret was that he was here with us for all too short a time…. Watch for part 3, on September 25th. What a lovely post Joanne! I never had a Doberman, but a friend had a black male, Crow, for over ten years. Dobermans are majestic, smart, and very loyal. Thank you, Erika. Dobes are extremely loyal. As a personal protection dog it was bred into them. They love and protect their people above their own survival. 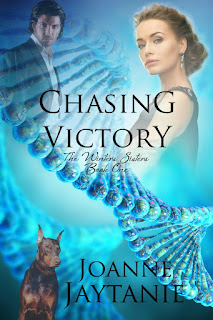 Today on #OurAuthorGang, author Joanne Jaytanie-Duncan​ talks about her love of dogs and how one in particular helped inspire her to write. This is wonderful, Joanne! Animals, and especially dogs, are always a source of great inspiration. Their unconditional love speaks volumes all on its own. Thank you, Joe. I totally agree, dogs can inspire a variety of things. Dogs really are man's best friend. I'm so glad you've had great dogs in your life. Great post. Thank you, Rebecca. I was very blessed with amazing companions. Love the photos, especially of Ralph with Dax. I wish I'd have know that special pup. Thanks for sharing from your heart about something that is so dear to you. You would have loved, Dax. He was a lover, but also intimidating. No one messed with him. But if you were his friend he was loyal to the end. I wish I had a picture of him running through the field playing with Noel's aussies. It was really a sight to behold. One of them barreled him over, and Dax took it all in stride. Lovely, emotional post. It's so good to read about people who care deeply for animals in this world of hatred and abuse. Thank you, Nikki. I'm with you, no animal should be abused, ever, for any reason. 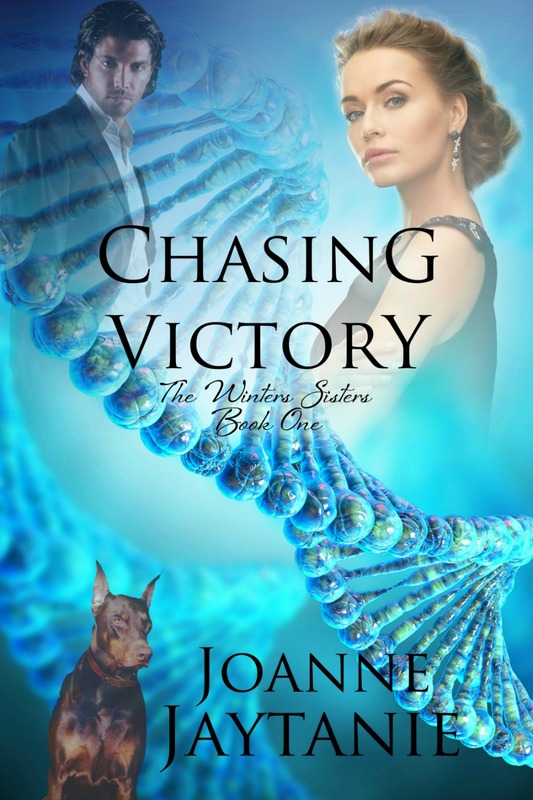 Joanne Jaytanie shares more about her love of dogs. I've always thought Dobermans to be so elegant. Nice to know they are also loveable. I love these posts, Joanne. Thanks for sharing them. Thank you, Toi. Dobermans are very elegant and they are the biggest goof balls. Your love for your dogs is just beautiful. What a heartfelt post. Lots of great information here for those who might be interested in getting a Doberman. They sound like great dogs. I love how you include them in your stories. They are surely your muse. I really enjoyed your post today, Joanne. Thank you so much. I really appreciate it, Lorraine. +Joanne Jaytanie My pleasure. I'm a dog lover as well.